As seen in "MythBusters: Is Yawning Contagious?" 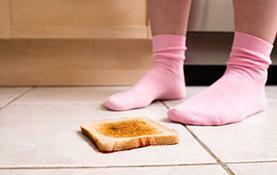 Explanation: In ancient Rome, parents apparently fretted over their children's toast falling and landing buttered-side down, since the breakfast table accident supposedly forecasted bad luck. MythBusters Jamie Hyneman and Adam Savage had excellent luck, however, in determining whether the floor mysteriously favors the buttery side of bread. Jamie and Adam built a toast-tossing machine and threw about 50 slices of each type of toast — unbuttered and buttered — then compared the results. Like flipping a coin, the dry toast landed an almost even number of times on both sides, and the buttered toast behaved about the same. With 29 of 48 buttery slices plopping buttered-side up, the breakfast myth was busted. But whether the Romans were right about butter-side down being a bad omen remains up in the air.